You can create a fresh flower bunny for a spring celebration or Easter centerpiece. This decorative floral piece could be a welcome, hostess, thank you or holiday gift for a friend or family member. The centerpiece will make a nice conversation piece for an Easter dinner. The novelty bouquet is an ideal arrangement for a garden club fundraiser at Easter time. Embellish the floral piece with a carrot and a tiny basket for a different look. Cut two ear shapes from the pink felt or card stock. Glue them to the piece of white felt or card stock with craft glue. Let the ears dry thoroughly. Cut out two black circles for the bunny eyes from black felt. Cut out 16 black felt circles or tear drop shapes that are about 1/2 inch long for the pads of the bunny toes. Set aside. Place floral foam into the container. Make sure it is secure. Pour water on the foam and allow it to soak in thoroughly. Choose three well-rounded carnations for the head. Cut the stems to a 6-inch length with a sharp knife. Use floral tape to loosely bind the stems together to form a ball shape. Place the head stems into the top front of the foam. Add three 5-inch tall carnations behind the head to form a body. Cut two carnation stems at 5- to 6-inch lengths. 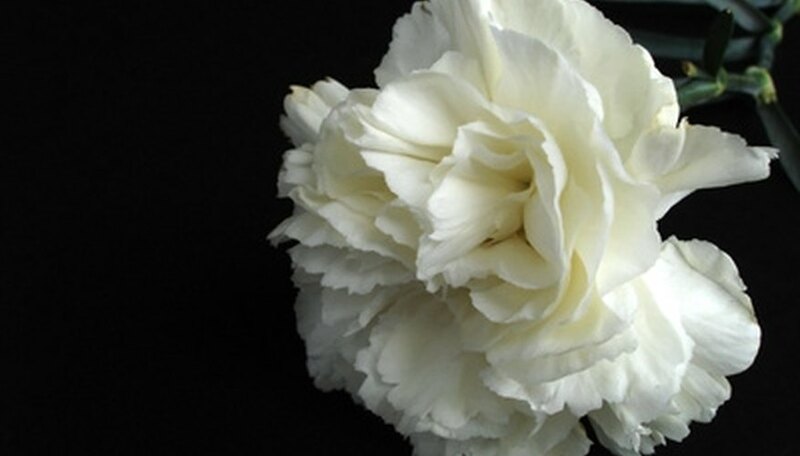 Set the carnations firmly into the foam on either side of the carnation head. They should press up to the sides of the head, creating the effect of cheeks on the bunny face. Cut the remaining carnations stems at 3 to 4 inches long. Insert two carnations into the foam for each leg on all four corners. The carnations should extend outward at the front and back of the head and body. Fill in any exposed foam or carnation stems with short pieces of greenery. Glue the ears to the back of the bunny head with floral adhesive. The bottom of the felt or card stock should fit in between the petals. Glue the eyes and nose pom pom to the face with the adhesive. Shape a chenille stem into a rounded 'w' for a mouth and glue to the face directly under the nose. Cut six straight 4-inch chenille pieces for the whiskers. Glue the whiskers into the carnation cheeks. Glue the pom pom tail at the back of the body. Glue the felt toe pads to the four carnations. Add a fluffy ribbon bow at the bottom of the head for a decorative touch. You can make a bunny with silk flowers. Use a fresh ball chrysanthemum for the head for a fluffy appearance. Do not use hot glue to attach the features to the bunny. Use floral adhesive only.